"This recipe has been a favorite in the Polzin family for a long time and makes a great summer grilling treat!" In a medium container, mix onion, Sauterne wine, soy sauce, vegetable oil, and dry mustard. Place pork chops in the mixture. Cover, and marinate in the refrigerator 8 hours, or overnight. 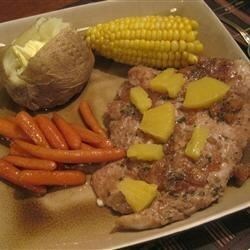 Turn pork chops once while marinating. Prepare an outdoor grill for high heat, and lightly oil grate. Arrange pork chops on the grill, and cook 5 to 7 minutes on each side, to an internal temperature of 145 degrees F (63 degrees C). Top with crushed pineapple and brown sugar before removing from heat. Discard remaining marinade. Made this dish exactly as directed except had some fresh pineapple, so I used that. Really great tasting and moist chops. Will definitely make it again! Marinated over night, baked instead of grilled, added a little cajun spice. Will definitely make again. Excellent!! will be making again n again!! it was soo tender n tasteful! I skipped the wine and marinated only four hours, but it still turned out great. The family has requested it again! Hear were the best pork chops I've ever made! I made them up in the marinade and froze them then when they thawed out I grilled them. Absolutely delicious! I will make these again! Yummy! Loved it and will definitely make again.